This Winter has been the absolute pits when it has come to illnesses in our home. Mr T is a chronic allergy sufferer - he has both food and skin allergies, severe eczema and is also prone to picking up every single bug going around Melbourne town. This year I too have been battling weird and (not so) wonderful viruses and was recently diagnosed with a chronic sinus disease. I am trying my hardest to avoid surgery and the constant run of medication by seeking out remedies to help relieve both situations. I was thrilled to be asked to road test the Homedics Ultrasonic Cool Mist Air Humidifier as this was one such avenue I had been researching to try. Living in Antarctica Melbourne, we have our ducted heating on full blast from April through to October. The Winter cold air contains hardly any moisture and when coupled with the ducted heating, it is a recipe for itchy skin, eczema flare ups and my sinus disease to cause all sorts of havoc - and boy does it. 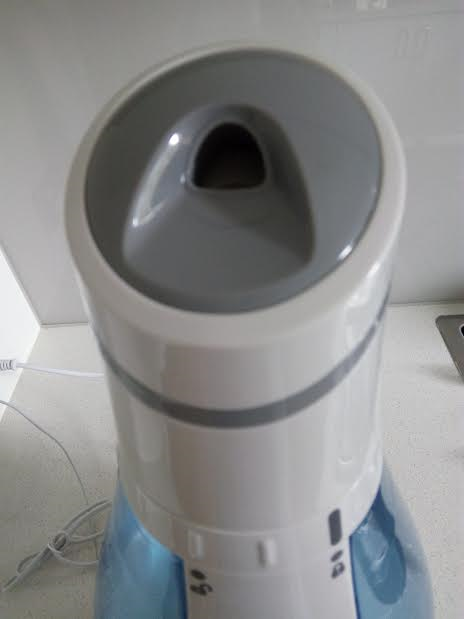 I was super keen to see if the cool mist humidifier would make any difference to our conditions, because switching off the heater and freezing to death just isn't an option for me! Many people associate humidifiers with hot steam (me included), but the cool mist units are designed to convert the water in to a cool, fine mist that puts moisture back in to the air. They also have been proven to help with sinus issues, reduce the ability of airborne viruses such as the common cold and flu and assist in the recovery of such illnesses. The increase in moisture in the air helps to keep skin hydrated which is exactly what we need for Mr T and his eczema conditions. The unit I tried (Model CM50B) is designed to cover a small - medium area, it is a perfect size to use in a single room such as a bedroom or a lounge area but not large enough to do the whole home. I have been using our unit in the lounge/living areas during the day and moving in to the bedroom at night. Being a light sleeper, I was a bit worried about the noise factor, but the unit is surprisingly quiet and soothing to use at night and even gives off a lovely little glow if you like. 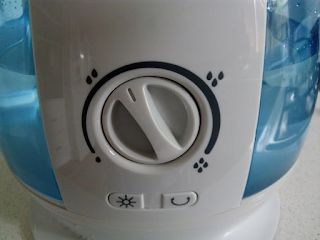 If you have curious little ones, the cool mist units are a lot safer to have around the home. There are 4 levels of mist and the head oscillates to distribute around the room. I have been using mine on a level 2 setting. The unit also has an automatic shut off feature when empty, so this gives you peace of mind when using at night. If you fill the unit right up, you will get 48 hours of run time - pretty impressive and definitely long enough to run all night and day. Now I wasn't expecting the Homedics Ultrasonic Cool Mist Air Humidifier to completely cure our conditions, but I am happy to report that there has been a significant improvement for both Mr T and myself. Mr T's eczema riddled skin has been noticeably more hydrated and we have had less flare ups when using the unit in conjunction with our ducted heating. We were experiencing ultra dry skin on his neck, forehead and cheek areas that we could not get on top of. Overnight Mr T would be frequently scratching these areas in his sleep, but we have found this all to have improved in conjunction with his lotions and potions of course. As for me, I have noticed that my sinus condition has eased up, particularly in the morning. I had been frequently been waking up with a headache from the get go, but I am happy to have noticed this has improved. I have also noticed that my skin has been a bit more hydrated as well (an added bonus I wasn't expecting!). We are almost in October and Melbourne has not turned on any warm Spring weather just yet. So it looks like the ducted heating (and humidifier) will be working well in to November at this rate! 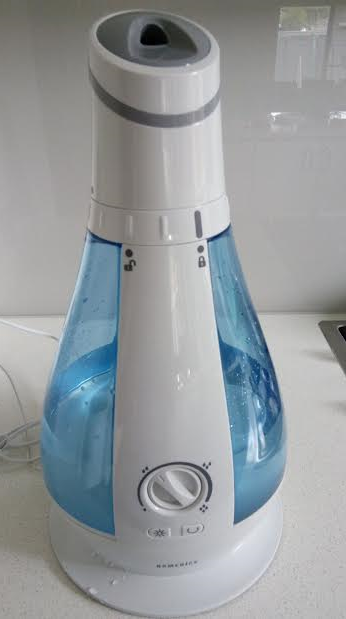 Have you tried a humidifier? Did it work? Love to hear your thoughts below. The Homedics Ultrasonic Cool Mist Air Humidifier has an RRP of $99.00 and can be found at leading retailers Myer, Good Guys, Shaver Shop and Betta Electrical.